Swami Suryananda suggests ways to help us stay clear minded and positive, in the midst of great political and social upheaval. Divine Friends, there’s been an awful lot in the media in recent weeks about the American election. About Donald Trump, Hilary Clinton and their effect on the world. In a sense this is all maha karma. (Karma affecting populations and countries). What we can pray for, what we can seek the grace of the Lord for, is to help those in the world who are weak. Who are vulnerable, who cannot speak for themselves, who are poor, who have no healthcare, who have no shelter. Who don’t have the freedom to worship, who are suppressed. We can seek that the grace of God protects those people, no matter what administration is in power, in whatever country in the world. It is nigh on impossible for us to understand maha karma – to understand the ripples that are set in motion by those people who are set in positions of power and authority throughout the world. But we can pray deeply for world peace. We can pray deeply that when there is vested interest, when there is greed, when there is aggression, hostility, arrogance and ego manifesting in the decisions of the leaders of the countries of the world, that somehow those who are living in dharma are protected from that – from that maha karma. The Lord will respond to that prayer. The Lord will respond to that – if we make that effort to draw the Lord’s attention to that. Those in the world who are aspiring to uphold dharma need to begin by being fully self aware. To really understand the vibrations of cause and effect that we set in motion through our actions, our words and our thoughts. Only then can we become effective instruments of the Lord in upholding dharma. And we will then be able to exercise great power in our lives, in positively impacting on the lives of others, through our own actions and the power of prayer. To be able to lift that veil of obscurity, so that the Lord within us becomes manifest, we need to exercise that self awareness, that mindfulness. It’s very easy to understand the gross manifestation of our lower nature. To be aware of our impulsive anger and aggression, our selfishness – all of those things that manifest very easily in our daily interactions. What it’s more difficult to perceive are those subtle levels of that lower nature, deep within our being, which only manifest, or manifest more, when we lapse in our spiritual sadhana – when we are pressurised in our daily lives by the events that happen around us. Then those subtle parts of our lower nature begin to manifest. And we realise that we may have mastered that impulsive reaction to be aggressive – to be short with another person. But only when we’re pressurised will those subtle elements of our lower nature manifest. 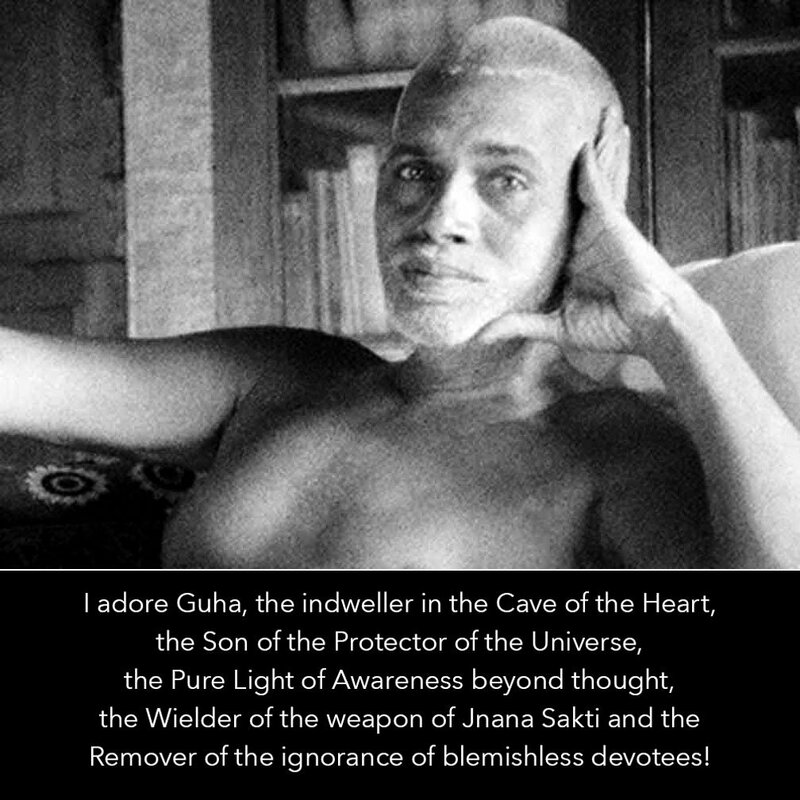 And we need to think about this Divine friends. We need to work on that. We need to seek the grace of God to transform that. That’s what spiritual sadhana is about. We can’t do that on our own. We need the shakti and the power of the Lord to transform that vibration, so that “Guha” – the hidden Lord within us, becomes manifest. “Brahmanyaya Namaha” – Knowledge of the truth. Knowledge of the absolute of Brahma. Knowledge that we are Almighty God. And that shakti, that Vel of Lord Subramanium is the shakti of sathyam – of truth, of jnana, of wisdom, of knowledge of the Self. So we need to seek that shakti, that power of the Lord so that our consciousness is elevated. So that in our interactions, we have the awareness that we are interacting with Almighty God. That we are Divine. That those around us are Divine. It’s easy to do that when we’re in the temple, but it’s not so easy to do that when we go about our daily lives, and we’re pressurised and we’re tired and we’re tense, and we’re trying to deal with all the problems and difficulties of life. 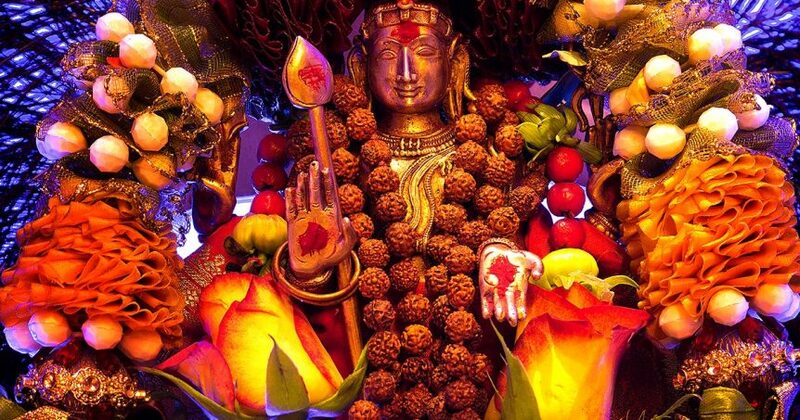 “Skanda Kumaran” – eternally youthful and joyful. Full of joy! Spiritual sadhana is not about being ‘holier than thou’. It’s not about being super-serious. It’s about pervading that vibration of joy amongst our fellow human beings. It’s about uplifting each other’s vibration. It’s about understanding each other, and understanding ourselves. In the bigger picture of things, all of the aberrations that our fellow human beings have don’t really matter. They are Divine by nature. We are Divine by nature. And if we go about our lives with that joyful, youthful feeling – Kumaran eternally youthful – that will have a great impact on our lives, and the lives of those around us. Just look at your day, from when you wake up in the morning. I’m like that in the morning. I’m terrible. And you just don’t want to communicate with anyone, because you’re half asleep. And then nobody wants to interact with you because they’re frightened they’re going to get their head bitten off! It takes an effort to be positive. It takes an effort to be joyful. It takes an effort to concentrate in the temple. We talk about karma yoga – that yoga of service. Yes, it’s an effort to go about serving life. It’s an effort to go about feeding people, looking after our families. But spiritual sadhana doesn’t work in isolation – you need to make an effort in your worship and in your mindfulness, because one thing complements the other. Unless we look at the whole picture (we may make an effort in one part of our lives, but really neglect the other part of our lives) then we’re not using the opportunity the Lord has given us, to really accelerate our evolution and to perfect ourselves. 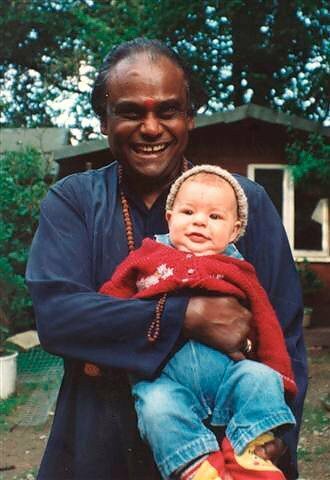 To realise our Divine nature – which is the purpose of our birth Divine friends. Coming to a place of worship, a place of pilgrimage, we refresh ourselves in that consciousness. We change our vibration. By chanting the name of the Lord, we change our vibration. All of these practices that have been established for thousands of years, in the Agamas, and the Vedas – they’re not just practices for swamis, for rishis and saints. They’re practices for all of us. Tried and tested practical methods to transform our vibration. To become Self aware. When you’re feeling negative you don’t want to go in the temple. You don’t want to go anywhere near God. You don’t want to spend time praying, you don’t want to spend time identifying with the Divine. You just want to be left alone. And then what happens is that your consciousness is lowered. And that gives the opportunity for your lower nature really to manifest. For your gross nature (which is in every single one of us) to become manifest. And then it becomes a difficult job to elevate that consciousness. It becomes a difficult job, because you don’t want to know. You’ve got other things to do. But you don’t feel happy about yourself! You’re trapped in this cycle of that lower consciousness. You are the one that can change that. If you make that little bit of effort. You don’t have to spell it out. Just through those actions of love you can elevate another human being’s consciousness. These are the things that we need to be doing in our lives Divine friends. That basic, simple human interaction of love. It is a prerequisite for us to evolve spiritually, and to be receptive to the grace and the shakti of the Lord. If there is no love in our lives, then there is no God in our lives. We need to pray for that. We need to pray for that awareness, pray for that consciousness, pray for that opportunity. And then slowly our lives will become transformed. That is what a community is about. And the community here is not just the monastic community. You are all part of our family. You are all part of our community – a community of people aspiring to serve God, and grow in that consciousness of their own Divine nature. Watch an in depth interview with one of Guru's earliest companions.